Having a dual purpose battery is the most practical purchase that you have done or will have to do to upgrade your marine battery. Dual purpose batteries are ideal for vehicles that require deep cycle service and at the same time start engines. They deliver powerful crank ampere for you to easily start your engine and low ampere for reliable auxiliary power, such as a trolling motor. This is the perfect compromise between the two batteries. An ideal purchase is a deep cycle battery for the accessories and auxiliary power and a starting battery for the engine starter. But with a Dual Purpose AGM Battery, you only need one battery for starting and auxiliary. This type of technology in batteries is not just practical but also make life simpler for the boat enthusiast. 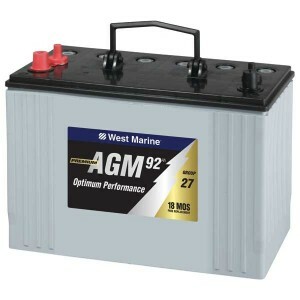 There are different sizes of reliable Dual Purpose AGM Batteries which are good for your boats depending on the need. Different types of batteries have their own advantages and disadvantages. For this type of battery here are the advantages. Maintenance free The battery is practically maintenance free. Maintenance free means that you still have to clean and check the terminals every now and then for corrosion. No battery is free from corrosion even if it is maintenance free. You do not have to check the level of distilled water on the dual purpose battery since it is AGM type. Low Self Discharge rate – good thing about this type of battery is that you can store it during the winter and will not discharge fast. Or like what most of us do is keep it in the boats. It will discharge but only about 1% – 3% a month. This is a good thing especially if you cannot check on your boat regularly. The battery charges quickly – since it is for deep cycle and for starting, charging is not a problem. You can reach 100% charge capacity lesser than regular flooded batteries. Spill proof – it is one of the safest batteries to use for marine. It doesn’t spill and is safer to operate. Dual purpose batteries were originally designed as flooded batteries back in the days but now we are fortunate to have dual purpose AGM batteries. Resistant to vibration damage – the battery case is built tough and can resist the biggest waves and engine vibration and trolling motor usuage. Can be installed in almost any position (except upside down) – this unique capability of the battery makes it truly one of a kind battery for big or small boats. When it comes to the best marine batteries, there are a ton of choices to choose from. You have the flooded batteries, the gel batteries, the AGM batteries. You have batteries for marine starting or deep cycle service. And of course the dual purpose battery. They have their own merits, but is the dual purpose AGM battery actually a good choice? When choosing a battery for your boat the dual purpose battery is best for small and medium sized boats. It is also recommended for caravans with moderate energy requirements. The reason why you would want to buy a dual purpose battery is that you will be charging and discharging it more often than usual. For example, if you have a sailboat that you need to start but at the same time you use other auxiliary power while the boat engine is off, you discharge the battery. With this type of battery, you won’t worry about not being able to start your engine while in the middle of nowhere. Even if battery is used for TV, stereo lights and other electronic devices while the engine is off, you will still be able to start your engine. If you have a dual purpose AGM battery you can deep cycle the batteries again and again without taking heavy damage because it is designed to deep cycle again and again and again. If you notice, your average dual purpose AGM battery is heavier than flooded batteries because it has more lead. And more lead means more capacity. It can cycle up to about 400 times. Back in 2008 you could only purchase flooded dual purpose batteries. They were quite expensive back then. If you want what’s best for your boat you can now purchase a dual purpose AGM battery. As we have already said, AGM batteries are far better than flooded batteries for marine use. 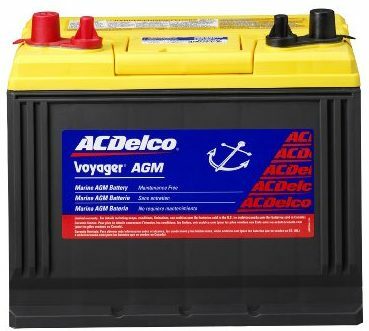 So, having a dual purpose AGM battery is probably one of the best purchases for your boat. 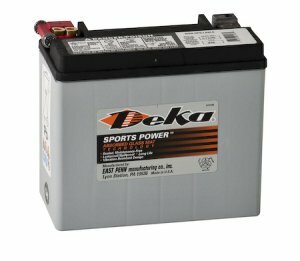 Since dual purpose batteries nowadays are AGM instead of flooded, their life expectancy is longer and capacity is bigger. This means you get more out of your money. Here are different types of Dual Purpose AGM batteries available in the market. Most notable difference in the batteries is their size and AMP hours. Choose a dual purpose battery according to your boat’s specification. Group 24 Absorbed Glass Mat (AGM) Battery, 12V, 79 AMP Hours, 9 7/8″H x 10 7/8″L x 6 3/4″W, 53 lb. Group 27 Absorbed Glass Mat (AGM) Battery, 12V, 92 AMP Hours, 9 7/8″H x 12 3/4″L x 6 3/4″W, 63 lb. Group 31 Absorbed Glass Mat (AGM) Batteries, 12V, 105 AMP Hours, 9 3/8″H x 12 15/16″L x 6 3/4″W, 69 lb. Group 4D Absorbed Glass Mat (AGM) Batteries, 12V, 198 AM Hours, 10 1/8″H x 20 3/4″L x 8 1/2″W, 131 lb. Group 8D Absorbed Glass Mat (AGM) Batteries, 12V, 245 AMP Hours, 10″H x 20 3/4″L x 11″W, 161 lb. Group 6V Absorbed Glass Mat (AGM) Batteries, 6V,190 AMP Hours, 10 7/8″H x 10 1/4″L x 7 1/8″W, 70 lb. Group U-1 Absorbed Glass Mat (AGM) Battery, 12V, 32 AMP Hours, 7 1/2″H x 8 5/16″L x 5 1/8″W, 24 lb.